The route into higher education can be complicated for some students. Within our presentations, we aim to provide students with different perspectives and advice on specific areas. The talks below are available to students in the first and second year of sixth form or college. We recommend the complete programme, starting with choosing a course and university in the first year and working through the programme to finance and budgeting. Talks usually last for 30–60 minutes, with time for questions and an interactive exercise. The step into higher education is a big one. Getting on the right path is crucial to a student's performance and success, both academically and in future life. 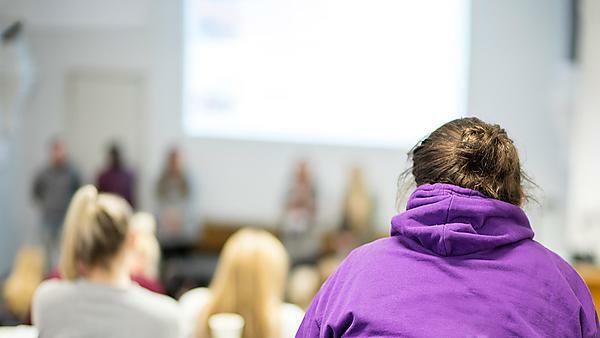 This talk offers students advice on how to choose the right course and university for them, giving tips on how to research effectively and where to find useful information. There are many preconceived ideas about what a typical day in the life of a student is like, and we aim to give the real picture. Presented by one or more of our student ambassadors, the student life talk is an important aspect of your students' self-discovery. We offer advice and guidance on all aspects of student life, from doing the weekly shop to managing time and workload. The application process can seem like a daunting prospect, but with a step-by-step breakdown of the process, and a university perspective, we hope to demystify and reassure students and staff alike. Using information straight from our admissions tutors, we give tips and hints to help students construct a successful personal statement. An interactive exercise helps students promote their skills and achievements. Once students have started to receive their university offers the next stage of the decision process can be difficult for them; choosing their firm and insurance universities. The aim of this talk is to provide tips and advice on how to make the right decisions for them, and includes information about important dates and how to respond via the UCAS website. Student funding is often a worry for prospective students. This talk offers advice regarding tuition fees, student loans, scholarships and the application process. Our budgeting game lets them try out money management first hand. With strengths across a wide breadth of subjects, the University of Plymouth offers a wide range of expertise. Accompanied by academic staff, we can present more detailed information on specific courses should your students have a particular area of interest.